Cargotec is a technology leader with strong market positions in all business areas, Kalmar, Hiab and MacGregor. We have leading brands in markets with long term growth potential and several megatrends, such as urbanisation and growing middle class, support our businesses. Our aim is to transform from an equipment provider into a leader in intelligent cargo handling. We will achieve this by focusing on our four strategic must-win battles: customer centricity, services, digitalisation and productivity. ***2017 figures have been restated according to IFRS 15. MacGregor, part of Cargotec, has entered into an agreement to acquire the major businesses from TTS Group, a global provider of cargo handling equipment and services for merchant and offshore ships for an enterprise value of EUR 87 million. The combination of two highly complementary businesses will produce greater scale and diversification and will strengthen MacGregor's portfolio and market position in key markets for cargo and load handling equipment. Based on preliminary estimates, potential cost synergies are estimated to be around EUR 30-35 million on annual level and are expected to be reached within 3 years from closing. Cargotec’s M&A strategy is focusing on bolt on acquisitions. In Kalmar, the focus is on service footprint expansion and software offering. Hiab is focusing on expanding geographical presence and product offering, whereas MacGregor is looking for M&A opportunities on distressed assets and software as well as intelligent technology. By choosing the year from left the can find announced orders published as stock exchange or press releases, excluding smaller order releases. You can access the original release via the link in the first column. All releases can be found in here. construction industry activity and truck registrations in Europe. Cargotec is determined to grow its business through strong customer focus. We offer products, integrated solutions and services designed to meet customers’ specific needs. Our customers include leading global and local players within their industries. ​Cargotec is a leading player in all of its business areas. Below you can find a table of the competitors of Cargotec's business areas. Find a description of Cargotec's short term risks and uncertainties. The text is updated quarterly. Developments in the global economy and cargo flows have a direct effect on Cargotec’s business environment and customers’ willingness to invest. A slowdown in global economic growth could reduce the growth in container traffic. Furthermore, the consolidation of ship companies and container terminal operators as well as the relatively low penetration of automation technology could postpone the customers’ investment decisions regarding container handling automation. Project executions may face risks related to schedule, cost and delivery guarantees. Furthermore, potential bottlenecks in the supply chain could postpone deliveries and have a negative impact on sales and results. Uncertainty may be increased by risks stemming from political instability, volatility on the currency and raw material markets, or from the financing sector. In addition, a trade war could have an impact on global flow of goods and therefore on the demand of Cargotec’s solutions. Hiab’s demand is impacted by the development of the construction market. A significant share of Hiab’s orders are from the United States. Even though the cash flows are hedged for the existing order book, the weakening of the US dollar in the longer term could weaken Hiab’s results. Greater difficulty in obtaining financing would weaken customers’ liquidity and investments. MacGregor's market situation still involves uncertainties. It is anticipated that the oversupply in the merchant ship market will take longer to balance out, since capacity will continue to increase while demand is expected to grow very moderately. At the same time, the uncertainty regarding oil price development has led to an intense fall in investments by the oil industry and created oversupply in the offshore market. The concurrent deterioration in both markets has a negative impact on the financial situation of shipyards and ship owners, as well as ship operators. In the challenging market situation, customers may also try to postpone or cancel orders. In some cases, the financial situation of customers may deteriorate significantly or even lead to customer insolvency. Cargotec is involved in certain legal disputes and trials. The interpretation of international agreements and legislation may weaken the predictability of the end results of legal disputes and trials. Risks regarding Cargotec’s acquisitions are related to, for example, the knowledge of the local markets, authority processes, customers, corporate culture, integration as well as key employees. There are also ethical risks related to the industries and the geographical scope where Cargotec operates in. Cargotec has increased its investments to develop ethical business practices and the related internal processes are continuously being developed further. More information on risks is available at Internal control and risk management. The following external organizations provide relevant and useful information about the markets of Cargotec and the business areas. You may access the material below via the links which direct you to the website of each organisation. Drewry - Information and analyses of shipping industry, e.g. estimates on future global cargo volumes. Oxford Economics - Leader in global forecasting and quantitative analysis. For instance, analyses of construction industry in different geographical areas. Clarksons - World’s leading provider of integrated shipping services. Clarksons provides forecasts of e.g. merchant ship and offshore unit numbers. IHS Markit - Useful analyses of Maritime & trade or automotive industries. R&D investments focus on digitalisation as well as improving competitiveness and cost efficiency of products. Research and product development expenditure in 2018 totalled EUR 89.0 (92.5) million, representing 2.7 (2.8) percent of sales. EUR 0.5 (0.5) million was capitalised. First application key for Kalmar Key, the terminal industry's only automation platform with open interfaces. Kalmar announced its commitment to reduce emissions in cargo and material handling operations by fostering eco-efficient technologies. According to the commitment, Kalmar's full offering will be available as electrically powered versions by 2021. The portfolio of JONSERED recycling cranes was extended with four renewed and two new models, the 1250RZ and 1500RZ. In services, Hiab rolled out it’s ProCare™ Total Repair & Maintenance (R+M) programme globally. At a fixed monthly price, customers benefit from increased equipment uptime and reduced total cost of ownership, with their equipment value maintained with Hiab original parts. Hiab rolled out its connected service HiConnect™. HiConnect enables businesses to gain real-time insights into their fleet and load-handling equipment utilisation and operation, enhancing uptime, productivity and safety. Hiab launched its renewed HIAB light range loader cranes with a capacity from 4 to 11 metric tonnes. Hiab launched the new MOFFETT M5 NX truck mounted forklift which is especially designed for medium to heavy-duty tasks. The new MULTILIFT COMMANDER container handling unit was also presented to the markets. This application is new for the commercial hooklift market, enabling handling containers safely and efficiently in locations where no infrastructure exists to load or unload containers from the truck. Hiab opened Vision Lab, the latest addition to the Test and Innovation Centre in Hudiksvall, Sweden. The new facility enables testing the latest technologies with imaging, visual and object recognition under different conditions. Hiab’s production units were awarded new, stricter ISO certifications for quality assurance, sustainability and safety, replacing earlier Hiab-wide ISO certifications. Hiab continued to expand its spare parts web shop which now covers 46 countries. Hiab launched the MULTILIFT hooklifts for the US market. Hiab opened a new installation and competence centre in Meppel, the Netherlands. Finland–Singapore Maritime innovation camp, held in September in Singapore, sought ways to improve stevedore working conditions. MacGregor was one of the event’s corporate partners together with PSA Corporation. MacGregor introduced a new breakbulk cargo stowage solution, the Breakbulk Optimiser, which enables operators to rapidly and optimally plan the stowage of many different types of cargo, increasing vessel utilisation rates significantly and therefore improving business performance. MacGregor developed a unique new system for improving port and voyage efficiency for RoRo vessels. MacGregor and China State Shipbuilding Corporation's (CSSC) Nanjing Luzhou Machine Co., Ltd. (LMC) celebrated the opening of their first joint venture in China. MacGregor and SeaFocus announced a collaboration agreement that will support companies in creating new cooperation models to benefit maritime trade and drive industry innovation. According to our knowledge the following analysts have regular coverage on Cargotec Corporation. The list may be incomplete. The listed analysts follow Cargotec on their own initiative. Cargotec is not responsible for their views. You can find the consensus estimates here. Sustainability is a great business prospect for Cargotec as the inefficiencies in the industry are clear. Only the moving of empty containers cause 19 million CO2 equivalent tonnes annually while some calculations show that the inefficiencies in cargo handling chain cause EUR 17 billion costs to the industry. We see the need for increasing efficiency in the industry as a major business potential, while at the same time it means decreasing emissions. The future growth in our business comes from increasing demands for operational efficiency, the proliferation of lifetime solutions and from increasing cargo volumes. On the other hand, we need to ensure transparent and fair corporate governance, efficient environmental and health&safety management practices, efficient non-compliance programme and clear supplier management processes to have a license to operate in a more sustainability-driven market. For Cargotec, the willingness to increase more sustainable cargo flow is not only a sentence. We have created a product group which demonstrates the solutions which can benefit customers’ operational, emissions or resource efficiency. In environmental industries, our products and solutions can enhance the industry efficiency. Increased growth in offering for eco-efficiency is driven by R&D and digitalisation investments. fewer container moves in cargo handling and minimised environmental impact per moved container. Cargotec’s eco-efficiency product group sales during 2018 was about 21 (2017: 18) percent of the total sales. Three most important areas to manage in our own operations during 2018 are safety, supply chain management and increased usage of renewable energy. Additionally, we will continue our extensive work around anti-corruption practices, employee engagement and Offering for eco-efficiency development. We monitor our sustainability performance closely on various areas and set annual sustainability targets to ensure development. You can read more about our targets from Our sustainability work and targets section. Cargotec lowers the guidance for operating profit excluding restructuring costs and expects the operating profit excluding restructuring costs for 2018 to be EUR 235-245 million. Cargotec reiterates its outlook published on 8 February 2018 and expects its operating profit excluding restructuring costs for 2018 to improve from 2017 (EUR 258.6 million, IFRS 15 restated). Cargotec confirms the 2018 outlook published on 8 February 2018: Cargotec’s operating profit excluding restructuring costs for 2018 is expected to improve from 2017 (EUR 258.6 million, IFRS 15 restated). Operating profit excluding restructuring costs for 2018 is expected to improve from 2017 (EUR 263.2 million). Cargotec reiterates its outlook published on 8 February 2017 and expects its operating profit excluding restructuring costs for 2017 to improve from 2016 (EUR 250.2 million). Cargotec’s operating profit excluding restructuring costs for 2017 is expected to improve from 2016 (EUR 250.2 million). Cargotec’s 2016 sales are expected to be at the 2015 level (EUR 3,729 million) or slightly below. Operating profit excluding restructuring costs for 2016 is expected to improve from 2015 (EUR 230.7 million). Cargotec’s 2015 sales are expected to grow from 2014. Operating profit excluding restructuring costs for 2015 is expected to improve from 2014. Cargotec’s 2015 sales are expected to grow from 2014 (3,358 MEUR). Operating profit excluding restructuring costs for 2015 is expected to improve from 2014 (149.3 MEUR). Cargotec’s 2014 sales are expected to grow from 2013. Operating profit excluding restructuring costs for 2014 is expected to improve from 2013. Cargotec's 2014 sales are expected to grow from 2013. Operating profit excluding restructurings costs for 2014 is expected to improve from 2013. The acquisition of the Aker Solution's mooring and loading systems unit was completed 30 January 2014. Consolidation of the acquisition does not impact Cargotec's above-mentioned outlook for 2014. The sales and operating profit excluding restructuring costs for 2013 are expected to fall short of 2012. Cargotec reduces its full-year 2013 guidance given in July. Due to continued slippage in merchant ship deliveries, MacGregor's sales and operating profit for the second half of 2013 will be lower than expected. However, the underlying merchant marine market has continued to improve and the offshore market has remained active. In Kalmar, overall development in the third quarter has been positive, but there were further cost overruns in certain ship-to-shore crane projects.The sales and operating profit excluding restructuring costs for 2013 are expected to fall short of 2012. Earlier guidance was for sales to be slightly below 2012 and operating profit excluding restructuring costs to be at or slightly below 2012 level. Certain deliveries for MacGregor will be delayed and customers are postponing services. MacGregor's 2013 operating profit margin is expected to be slighty below 10 percent, as 2013 sales are falling short of the previously expected approximately EUR 850 million and now are expected to total closer to EUR 800 million. Cargotec's sales are expected to be slightly below 2012 and operating profit excluding restructuring costs to be at or slighty below 2012 level.This outlook is excluding the Hatlapa acquisition announced in July. Cargotec’s sales are expected to be slightly below 2012 and operating profit excluding restructuring costs to be at 2012 level. Positive impact of efficiency improvement measures implemented will be weighted on the second half of the year. The operating profit margin for 2012 is expected to be approximately 5 percent excluding non-recurring costs. Sales are expected to grow from 2011. Cargotec reduces its full-year 2012 operating profit margin guidance given in July. Due to cost overruns, the profitability of large projects in the Terminals business area fell below expectations in the third quarter, and therefore also the fourth quarter performance is expected to remain below previous expectations. Cargotec's guidance is also affected by slippages of deliveries over the year-end into 2013 in the Marine business area. The operating profit margin for 2012 is expected to be approximately 5 percent excluding non-recurring costs. Sales are still expected to grow from 2011. Cargotec's 2012 operating profit margin is expected to be approximately 6 percent. Sales are expected to grow from 2011. Cargotec reduces its 2012 profitability guidance given in April due to lower operating result in Terminals segment than previously expected. Cargotec's 2012 operating profit margin is expected to be approximately 6 percent. Sales are still expected to grow from 2011. Earlier guidance was for sales to grow and operating profit margin to improve from previous year's 6.6 percent level. Terminals and Load Handling segments' operating profit margins are still expected to improve from the previous year, but the margin improvement in Terminals will be clearly less than previously expected. Marine segment profitability is expected to continue healthy, although full year sales are expected to decline slightly from previous year. Sales in Terminals and Load Handling segments are expected to grow as a result of the order book. Terminals segment order book supports expectations that the segment’s profitability will clearly improve from the first quarter.Cargotec expects its 2012 sales to grow and operating profit margin to improve compared to 2011. Cargotec expects its 2012 sales to grow and operating profit margin to improve compared to 2011. Cargotec reiterates its 2011 guidance: Cargotec's 2011 sales are estimated to grow approximately 20 percent based on healthy January - September order intake. Cargotec's 2011 operating profit margin is estimated to be approximately 7 percent. Cargotec reiterates its 2011 guidance: Cargotec’s 2011 sales are estimated to grow approximately 20 percent. Healthy first half order intake both in Industrial & Terminal and Marine segments together with the recovery in the market situation support a more positive growth expectation. Sales growth and significant efficiency improvement measures executed during the past years, support profitability, but there is cost pressure on the markets. Cargotec’s 2011 operating profit margin is estimated to be approximately 7 percent. Cargotec’s 2011 sales are estimated to grow approximately 20 percent. Healthy first quarter order intake both in Industrial & Terminal and Marine segments together with the recovery in the market situation supports a more positive growth expectation. Sales growth and significant efficiency improvement measures executed during the past years, support profitability, but there is cost pressure on the markets. Cargotec’s 2011 operating profit margin is estimated to be approximately 7 percent.In February, Cargotec’s 2011 sales were estimated to grow over 10 percent and 2011 operating margin was estimated to continue to improve. Cargotec’s 2011 sales are estimated to grow over 10 percent based on estimated strong growth both in the Industrial & Terminal and Marine segments. The recovery in the market situation and increased order intake are estimated to boost growth for Industrial & Terminal while the strong order book in the beginning of the year is estimated to support growth in Marine sales. Cargotec’s 2011 operating profit margin is estimated to continue to improve as a result of growth and significant efficiency improvement measures executed during the past years. Guidance published 18 October 2010 reiterated: Cargotec continues to estimate 2010 sales to be on 2009 level for both Industrial & Terminal and Marine segments. Operating profit for 2010 is expected to be in the range of EUR 120-130 million including one-time restructuring costs.The recovery in the market environment and the resulting growth in order volumes support growth in Industrial. The sales of Terminal are expected to fall short of 2009 levels due to the slower recovery of these markets, as second half orders will not have an effect on full-year sales due to delivery times. Based on the healthy nine-month development, strong order book and new orders received still to be delivered during 2010, sales in Marine will reach year 2009 level. Based on the operational performance in the third quarter and particularly in September, Cargotec’s visibility on the timing and profitability of deliveries during the remainder of the year has increased. As a result Cargotec specifies upwards its operating profit guidance. Operating profit for 2010 is estimated to be in the range of EUR 120–130 million. Earlier operating profit was estimated to exceed EUR 100 million. Both the previous and now specified operating profit guidance includes one-time restructuring costs.Cargotec repeats its sales guidance published in July. Cargotec’s 2010 sales are estimated to be on 2009 level for both Industrial & Terminal and Marine reporting segments. Cargotec continues to estimate 2010 consolidated sales to be on 2009 level for both Industrial & Terminal and Marine segments and consolidated operating profit to exceed EUR 100 million. The recovery in the market environment and the resulting growth in order volumes support growth in Industrial. The sales of Terminal are expected to fall short of 2009 levels due to the slower recovery of these markets, as second half orders will have a minor effect on full-year sales due to delivery times. Based on the healthy first half development, strong order book and new orders received still to be delivered during 2010, sales in Marine will reach year 2009 level. There are tentative positive signs visible in the order intake for the Industrial business whereas uncertainty continues in the Terminal business. Based on the strong order book, sales in the Marine business are expected to remain on a healthy level in 2010. Cargotec’s 2010 sales are estimated to be on 2009 level and operating profit to exceed EUR 100 million. There are tentative positive signs visible in the order intake for industrial business. Uncertainty continues in port terminal business. Based on the strong order book, sales in marine cargo handling business are expected to remain on a healthy level in 2010. Cargotec's 2010 sales are estimated to be on 2009 level and operating profit to exceed EUR 100 million. It is estimated that still a few million euro in restructuring costs from currently ongoing restructuring measures will be booked during early-2010. Due to the weak market situation, demand for Cargotec's products and services is expected to continue clearly lower than last year. Despite expected growth in marine cargo handling business Cargotec's 2009 sales are estimated to decline approximately 25 percent from the previous year's. An estimated total of approximately EUR 70 million will be booked as productivity-improving restructuring costs for 2009, with EUR 37 million booked in January-September. Cargotec estimates 2009 operating result after restructuring costs to be negative. Due to the weak market situation, demand for Cargotec's products is expected to continue clearly lower than last year, the decline being milder in services. Despite expected growth in marine cargo handling business Cargotec's 2009 sales are estimated to decline approximately 25 percent from the previous year's level.An estimated total of approximately EUR 50 million will be booked as productivity-improving restructuring costs for 2009, with EUR 22 million reported in the first half.Cargotec estimates 2009 operating profit after restructuring costs to be slightly positive, however, cash flow from operations is estimated to continue clearly positive in the second half of 2009. The economic situation and investment activity continue to be uncertain, which makes it difficult to estimate demand for Cargotec’s products. This is further complicated by possible order postponements and cancellations. Sales in MacGREGOR are expected to grow in 2009. Sales of Hiab and Kalmar are expected to clearly decline from 2008 level. A total of approximately EUR 40 million of restructuring costs improving competitiveness are expected to be booked in 2009, of which EUR 9 million was booked in the first quarter. In the current uncertain economic situation it is difficult to estimate the demand for Cargotec's products. This is further complicated by possible order cancellations and delays. The preconditions for sales growth exist in services and MacGREGOR. Sales of Hiab and Kalmar are expected to decline from 2008. Significant restructuring measures costing EUR 35 million were decided on during 2008 to create a new supply platform and improve profitability in Cargotec. Focus is on the rapid implementation of these measures. Approximately EUR 16 million of these costs remain for 2009. Cargotec's board of Directors has confirmed the updated financial targets for Cargotec Corporation, announced on 5 September 2017. The updated financial targets reflect Cargotec’s increased profitability and stability. Cargotec’s must-win battles - Build world-class services offering, Lead digitalisation, Build world-class leadership - continue to form the core of the company’s strategy. With the must-win battles, we aim to become the global leader in intelligent cargo handling. The year 2018 was twofold at Cargotec. Orders grew strongly in all our business areas, but we fell behind our target to improve our result. Kalmar’s operating profit improved, but the weaker results for Hiab and MacGregor led to a lower operating profit at group level compared to the previous year. Although the demand for Hiab’s equipment and services continued to grow strongly, its operating profit declined, particularly as the US dollar weakened against the euro, but also due to challenges with the supply chain and related additional costs. MacGregor’s market environment was still challenging, which led to a lower sales and operating profit, excluding restructuring costs. 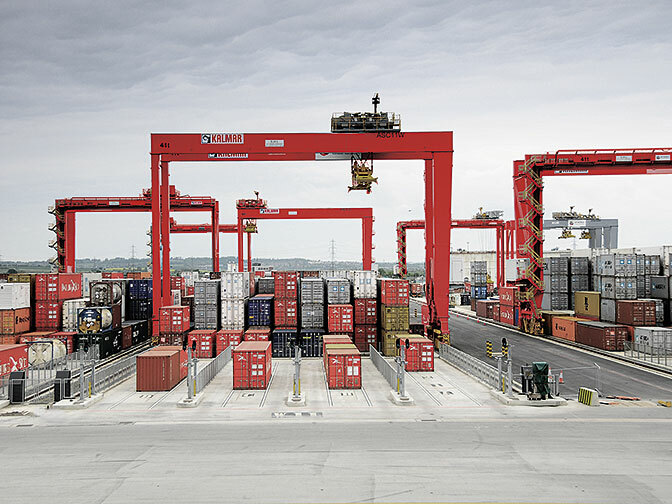 Kalmar’s operating profit improved, thanks to measures that improved productivity. Here you can find some frequently asked questions about Cargotec as an investment. Questions are divided to categories which can be accessed from the navigation list. In case you have other questions, please contact Investor Relations team. 1. What are Cargotec’s financial targets? Read more about Cargotec's financial targets and the development towards the targets here. 2. Which are Cargotec’s business areas? Cargotec’s business areas are Kalmar, Hiab and MacGregor. Kalmar offers industry shaping cargo handling equipment and automated terminal solutions, software and service; Hiab is the global market leader in on-road load handling, and MacGregor provides world-leading engineering solutions and services for offshore and marine industries. 3. What are Cargotec’s main customer segments? All business areas serve different customer segments. You can find the main customers by business areas here. 4. What is Cargotec’s geographical presence like? Cargotec operates in more than 100 countries all over the world. In 2018, 49 percent of sales came from EMEA, 31 percent from Americas and 20 percent from APAC. 5. When was Cargotec founded? Cargotec Corporation was formed in June 2005 when Kone Corporation demerged into two companies to be listed, Cargotec and KONE. However, the history of Cargotec did not start that year but over 100 years ago when Kalmar, one of Cargotec’s three business areas, started its operations. Read more about Cargotec’s history. 6. How many people does Cargotec employ? Cargotec employed 11,987 people at the end of 2018. 7. How much of Cargotec’s net sales is allocated to R&D? In 2018, R&D expenditure totalled EUR 89.0 million, representing 2.7 percent of sales. 1. Where are Cargotec’s shares listed? Cargotec’s class B share is listed on the Nasdaq Helsinki stock exchange. 2. How many share series does Cargotec have? Cargotec has two share series, out of which B share is listed. 3. How many outstanding shares does Cargotec have? The number of B shares is 55,182,079 and the number of unlisted A shares is 9,526,089. 4. Who are Cargotec’s largest shareholders? The list of Cargotec’s largest shareholders is updated every month and can be found under Shareholders section. Cargotec’s three major shareholders are Wipunen varainhallinta Oy controlled by Ilkka Herlin, Mariatorp Oy controlled by Niklas Herlin’s estate and Pivosto Oy, a company controlled by Ilona Herlin. Together these shareholders hold approximately 37% of total shares and 69% of the votes. 5. What is the current share price? Information about our current and past share prices can be found on shares section. 6. What is Cargotec’s dividend policy? Cargotec’s target for the dividend: increasing dividend in the range of 30-50% of EPS, dividend paid twice a year. You can find more information about dividend and dividend policy in Shares section. 7. When is the dividend paid out? For 2019, the Board of Directors proposes to the Annual General Meeting that convenes in 19 March 2019, that the dividend would be paid in two instalments, in March and October 2019. The payout dates for dividends are reported in IR calendar. 1. When does Cargotec publish its financial results? The publication date varies from year to year. The Financial review 2018 was published on 8 February 2019. Please refer to our IR calendar to find publication dates. 2. How are software sales calculated? Software sales include Navis business unit and automation software. 3. What is the basis of preparation of Cargotec’s financial statements? Cargotec Corporation’s consolidated financial statements are prepared according to the International Financial Reporting Standards (IFRS) as adopted by the European Union. 4. What is Cargotec’s reporting currency? The consolidated financial statements are presented in euros, which is the functional and reporting currency of the parent company. 5. Who are Cargotec’s auditors? On 27 December, the Finnish Patent and Registration Office designated Markku Katajisto, Authorised Public Accountant, as the company's statutory auditor for the financial year 2018, with the role taking effect immediately. Markku Katajisto replaced Tomi Hyryläinen as the company's auditor, as Tomi Hyryläinen announced on 20 December 2018 his resignation from this position. 6. Why does Cargotec use alternative performance measures (APM)? Cargotec uses and presents alternative performance measures (APMs) to better convey underlying business performance and to enhance comparability from period to period. APMs are reported as complementary information. Read more about APMs in section calculation of key figures. 7. What is included in restructuring costs? 1. Who are the members of the Board of Directors? At the annual general meeting 2018, Kimmo Alkio, Jorma Eloranta, Tapio Hakakari, Ilkka Herlin, Peter Immonen, Teresa Kemppi-Vasama, Johanna Lamminen, Kaisa Olkkonen, Teuvo Salminen and Heikki Soljama were re-elected to the Board of Directors. 2. Who are the members of Cargotec’s executive board? The list and information about the members of the executive board can be found in Governance section. 3. What are Board members’ annual remunerations? 4. How are Cargotec’s Executive Board members remunerated? The principles of remuneration at Cargotec can be viewed here. TEU TEU stands for Twenty-Foot Equivalent Unit which can be used to measure a ship's cargo carrying capacity. The dimensions of one TEU are equal to that of a standard 20′ shipping container. 20 feet long, eight feet tall.